This work by Vlaho Bukovac, from his most productive period, shows the moment of a young woman’s confession. 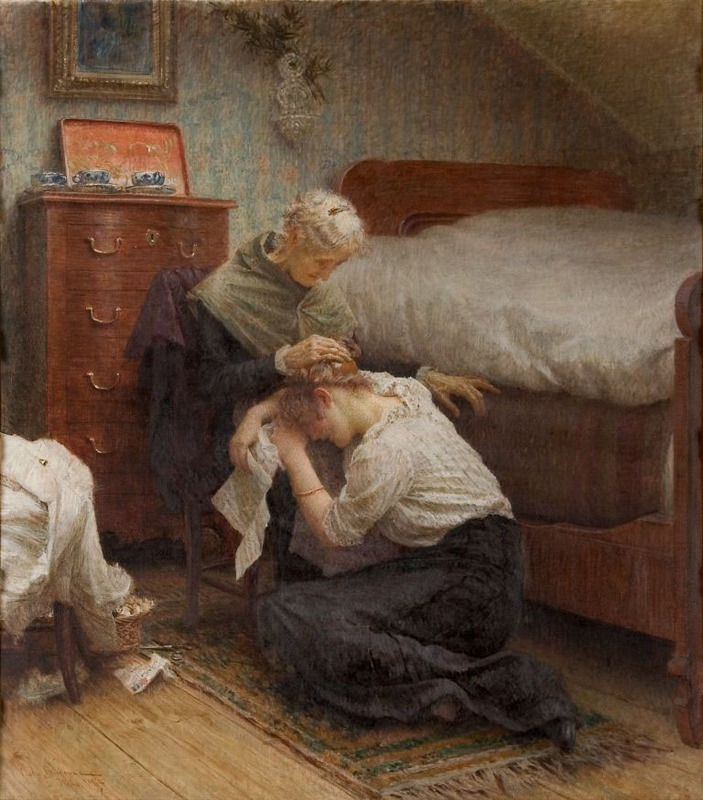 A very distressed girl is represented in the intimate space of her room, crouching by the feet of an old woman. The pale faced old woman, with her head bent down towards the girl, has put her right hand on the girl’s head while supporting herself on the bedside with her left arm. The dramatic charge of the moment is enhanced by the crumpled letter on the floor and a carelessly thrown white shirt on the left side of the painting. As a representative of academic realism, Vlaho Bukovac always created an embellished reality. This work manifests a masterful execution and refined colouration. He was one of the most prominent creators of modern Croatian painting. Bukovac was born in Cavtat and studied in Paris at the Academy of Fine Arts in the class of professor Alexandre Cabanel. Before completing the first year of studies he already exhibited at the famous Paris Salon (1878). Bukovac returned to Zagreb as a renowned world painter in 1893 and assembled young Croatian artists returning from studies in different European cultural centres to found the Association of Croatian Artists. He thus became the key personality in the development of cultural and artistic life of the Croatian people in that period. He devoted his best efforts to the establishment of an Academy of Fine Arts but, since his his dreams failed to materialise, he moved to Vienna and then to Prague where, in 1903, he was admitted as professor at the Art Academy. Bukovac stayed in that city until his death in 1922. Vlaho Bukovac developed his personal style based on the principles of academic painting. He never fully accepted impressionism, only touched upon symbolism. His works belong to the international school of painting from the turn of the century. Bukovac had a lasting influence on generations of young Croatian painters of his time, but also on some of the most important representatives of modern Czech painting.